Buy as many Blood Vials, Molotovs, Throwing Knives and Quicksilver Bullets as you can carry, and don't forget to stock up on Bone Marrow Ash. 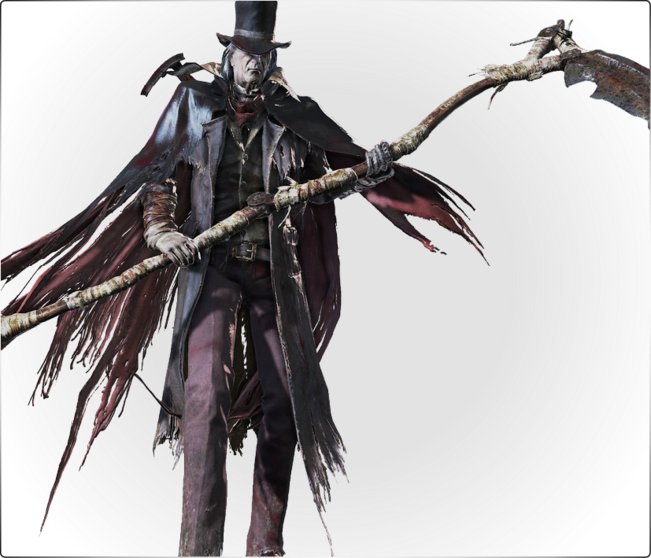 Gehrman is immune to poison, but has no other strengths or weaknesses, so you're free to use the weapon combination of your choice; however, the Reiterpallasch's ability to perform right-handed interrupts is extremely useful when combined with the Cannon or the Flamesprayer. Fit your weapons with gems that increase their attack power, and equip the Clawmark and Oedon Writhe runes to make your visceral attacks inflict more damage and restore Quicksilver Bullets. Gehrman is one of the fastest and most agile opponents you've faced up to this point, and can cover tremendous distances in an instant with his quicksteps. He can be interrupted and staggered, but is also capable of doing the same to you, and his near-bottomless reserves of health can cause the fight to drag on. During the first Phase he'll use his Burial Blade in scythe mode and will attack with wide, sweeping slashes. 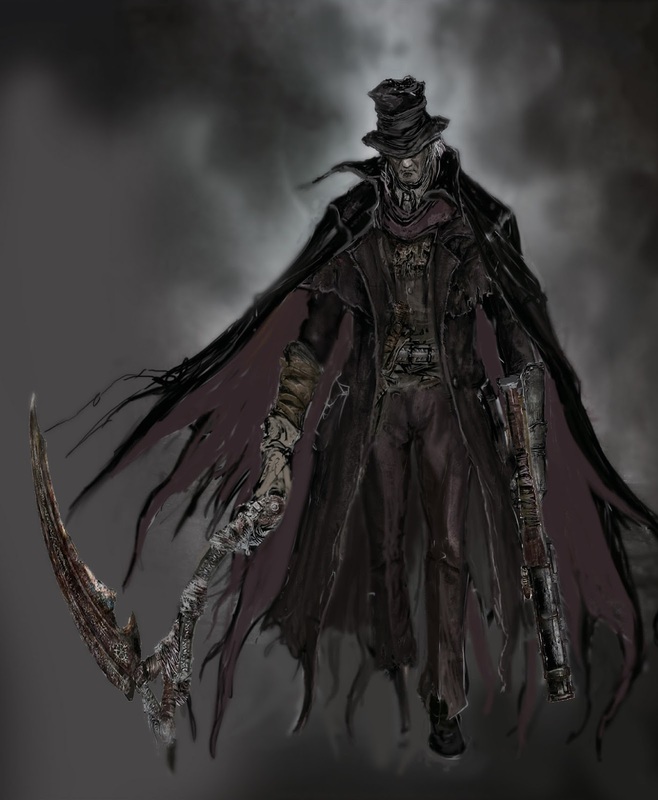 When Phase 2 begins, Gehrman will revert his weapon to sword mode and will begin using his scattergun in addition to much longer combos with his blade. If he interrupts you with a scattergun blast at close or mid range, he'll dash in and attempt to follow through with a visceral attack for massive damage; the only way to prevent this is to time your attacks carefully and avoid giving him easy opportunities to interrupt you. At the beginning of Phase 3 he'll use a more powerful version of the Quickening spell which grants him a large amount of super armor, and will begin switching between his weapon's normal and transformed modes; his attacks during this Phase are more aggressive and include an aerial projectile with a large splash damage radius, an enormous spherical area attack and a gunshot that will instantly stagger you if it hits. Interrupts are by far the most effective way to fight Gehrman, especially if you're equipped with the Clawmark and Oedon Writhe runes to boost their effects. Visceral attacks can be used in this manner to deal damage and restore your invaluable Quicksilver Bullets, but aren't always the best use of a stagger - if you use a transformed Reiterpallasch to interrupt Gehrman and immediately blast him with a Bone Marrow Ash Cannon shot while he's down, you'll inflict far more damage. If you aren't able to interrupt Gehrman, focus on baiting his combos and slow melee attacks, then strike him afterward as he recovers. If you need to heal, back as far away from him as you can before doing so - several quicksteps are usually necessary to reach the minimum safe distance. You'll face Gehrman in the meadow beyond the locked gate in the Hunter's Dream. This battleground has an irregularly-shaped border and a few crucifixes dotting the center, but no other notable obstacles; its most important feature is its moderate slope, which can cause some of Gehrman's attacks to pass over you if you're far enough below him. The open field provides plenty of space for you to fight, but also places Gehrman at a significant advantage due to his far higher mobility; its borders are fairly straight in most places, but be careful not to be backed into a corner near the gate or at the foot of the tree. You have to refuse Gehrman's offer in order to fight him. 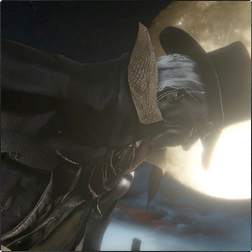 Cooperation: You can coop in Hunter's Dream for Gehrman, The First Hunter and Moon Presence bosses, once you open Gehrman as boss. If you didn't consumed three "One Third of Umbilical Cord", Gehrman will be the last boss. You can cooperate in Gehrman boss fight if you exit the fight by using Bold Hunter's Mark or by getting killed (same can be done for following boss). If Gehrman is attacked before prompting dialogue under the great tree boss battle will start immediately. When you beat Gehrman (as final boss), immediately after you get the Blood Echoes, use a Bold Hunter's Mark. You will be at the dream without having entered a new game. If you do it too early, all that happens is that you have to fight the boss again. If you want to go to new game + eventually, just walk into the middle of the arena. However, this does not work in cooperation because your Cooperator will prevent you from using Bold Hunter's Mark. 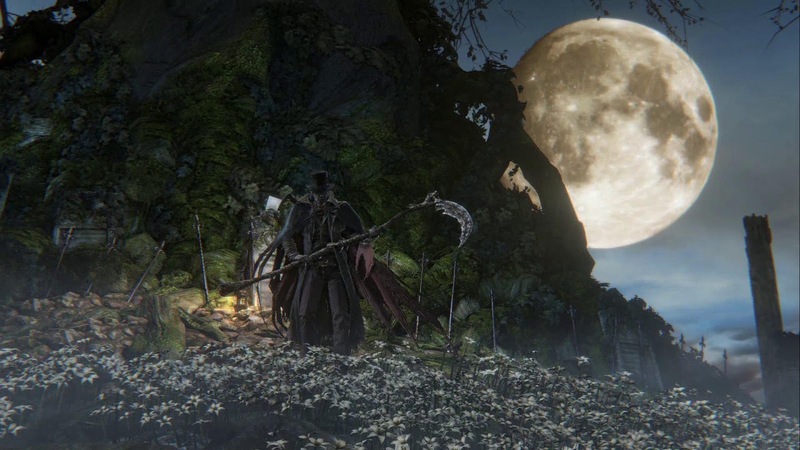 It is also possible to acquire Gehrman's blood echoes even when you have consumed three Third Umbilical Cords, quit application from PSN menu during the cutscene with the Moon Presence. After you return back into the game you will receive the echoes. Scythe Combos Yes Delayed charge attacks and faster quicksteps; many variations. Quickstep backward one to three times. Jumping Cleave Yes Slightly delayed two-hit aerial combo; quickstep sideways. Phase 1 Strategy: Avoid all of Gehrman's attacks except the Jumping Cleave by quickstepping backward one to two times; if he uses this move, quickstep sideways instead. All of his attacks during this Phase have pinpoint directional tracking and are almost guaranteed to hit you if you try to quickstep forward or sideways; the only option is to quickstep away from the first hits in his combos and either time a gunshot so that it interrupts him during one of the subsequent strikes, or wait for him to finish swinging and attack while he recovers. Most of his combos and individual swings leave enough time for you to hit him with a quickstepping attack afterward, but don't get greedy - it's extremely important to avoid dashing toward Gehrman too early and running straight into a delayed swing. He won't make much effort to evade during this Phase, so you can wear him down from a distance with thrown weapons like Oil Urns and Molotovs, but pay careful attention to your distance from him to avoid committing to the throwing animation while he's close enough to hit you with one* of his dashing attacks. Sword Combos Yes Quick one-handed slashes with heavy forward momentum; many variations. Quickstep to the left one to two times. Scattergun Blast Yes Used on its own or at the end of combos; can stagger you. Quickstep sideways twice. Visceral Attack No Used if one of his Scattergun Blasts staggers you at close range; time your attacks carefully and try to limit his opportunities to stagger you. Phase 2 Strategy: When Gehrman's health drops below 75% he'll revert his Burial Blade to sword mode and initiate Phase 2. His sword combos have heavy forward momentum but very poor tracking, so the best way to avoid them is by quickstepping sideways, particularly to the left; their long recovery periods will give you plenty of time to attack him afterward. During this Phase Gehrman will occasionally perform an ordinary forward roll followed by either a melee attack or a Scattergun Blast; this provides a good opportunity to interrupt him as he's coming out of the roll, since the timing is the roughly same for both attacks. Though he'll fight much more aggressively during this Phase, you should continue to interrupt him whenever possible and punish his combo attacks as he recovers. Advanced Quickening No Surrounds himself in a blue aura that grants the effects of the Quickening spell and strong super armor; cannot knock him out of this move. Moonlight Wave No Faces the moon with arms spread and charges for five seconds, then performs a massive spherical area attack; quickstep backward two to three times. Stagger Shot Yes Sometimes used immediately after transforming his weapon. Single fiery shot that instantly staggers you if it connects; quickstep sideways. Two-Stage Cleave Yes Long sidestep followed by a quickstepping slash in the opposite direction. Quickstep backward just before he performs the slash. Air Blade No Hovers in the air and throws a blade of wind with strong tracking and a large spherical zone of splash damage; quickstep backward two to three times. Transformation Attack Yes Two-hit scythe combo ending with a transformation attack that switches his weapon to sword mode; often followed by a sword slash or a Stagger Shot. Quickstep backward before each hit. Phase 3 Strategy: When his health falls to 50% Gehrman will begin Phase 3 with his Advanced Quickening spell, which makes him invisible during his quicksteps and grants him a large amount of super armor; your R1 combos will no longer cause him to flinch while this ability is in effect, so you'll have to be much more careful about when and how you attack. You can hit Gehrman a few times while he's charging his Moonlight Wave attack if you're close to him when he uses it, but be sure to leave yourself enough time to get out of the way. Apart from his new Phase 3 attacks, he'll essentially switch between his Phase 1 and 2 fighting styles, so you should approach him according to which weapon mode he's using. Interrupts are much trickier at this point but are still the fastest way to defeat him; otherwise continue to punish his combos with one or two attacks at a time. 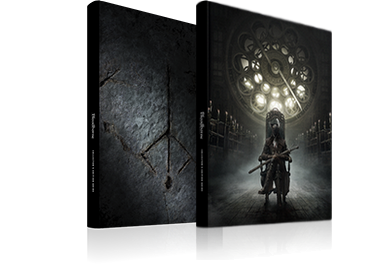 Good hunter, you've done well. The night is near its end. Now, I will show you mercy. You will die, forget the dream, and awake under the morning sun. Dear oh dear, what was it? The hunt, the blood, or the horrible dream? It always comes down to the hunters' helper to clean up after these sorts of messes. Farewell, my keen hunter. Fear the blood.